38 Landscape Architect and Specifier News Bill McNamara and his wife wanted a single- story house large enough for a landscape that would meet the needs of their entire family. 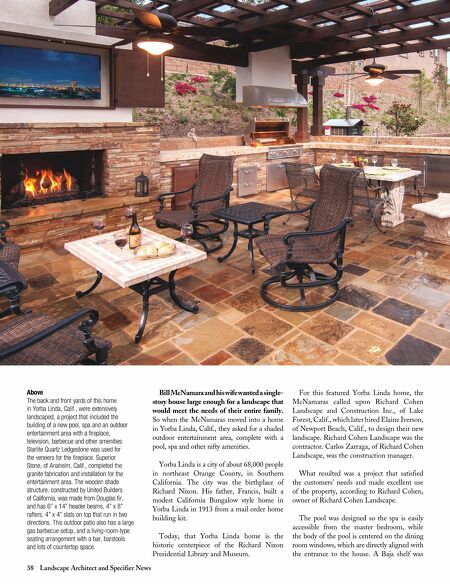 So when the McNamaras moved into a home in Yorba Linda, Calif., they asked for a shaded outdoor entertainment area, complete with a pool, spa and other nifty amenities. Yorba Linda is a city of about 68,000 people in northeast Orange County, in Southern California. The city was the birthplace of Richard Nixon. His father, Francis, built a modest California Bungalow style home in Yorba Linda in 1913 from a mail order home building kit. Today, that Yorba Linda home is the historic centerpiece of the Richard Nixon Presidential Library and Museum. 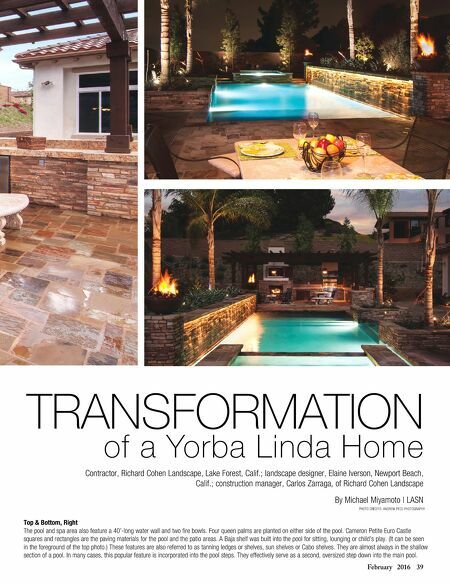 For this featured Yorba Linda home, the McNamaras called upon Richard Cohen Landscape and Construction Inc., of Lake Forest, Calif., which later hired Elaine Iverson, of Newport Beach, Calif., to design their new landscape. Richard Cohen Landscape was the contractor. Carlos Zarraga, of Richard Cohen Landscape, was the construction manager. What resulted was a project that satisfied the customers' needs and made excellent use of the property, according to Richard Cohen, owner of Richard Cohen Landscape. The pool was designed so the spa is easily accessible from the master bedroom, while the body of the pool is centered on the dining room windows, which are directly aligned with the entrance to the house. A Baja shelf was Above The back and front yards of this home in Yorba Linda, Calif., were extensively landscaped, a project that included the building of a new pool, spa and an outdoor entertainment area with a fireplace, television, barbecue and other amenities. Starlite Quartz Ledgestone was used for the veneers for the fireplace. Superior Stone, of Anaheim, Calif., completed the granite fabrication and installation for the entertainment area. The wooden shade structure, constructed by United Builders of California, was made from Douglas fir, and has 6" x 14" header beams, 4" x 8" rafters, 4" x 4" slats on top that run in two directions. This outdoor patio also has a large gas barbecue setup, and a living-room-type seating arrangement with a bar, barstools and lots of countertop space.